Conceived as a cost-no-object tour de force, even VAC was unprepared for the astounding leap in sound quality that comes from these two-chassis monoblocks. The sheer quantity of detail, drive, space and emotion revealed in familiar recordings is nothing short of shocking. It is the result of VAC’s “first principles” creativity and insights, which conceived a unique three-dimensional architecture for both the electrical and mechanical designs, aided by VAC’s Very High Speed Parallel (VHSP) technique. These finely crafted 450-watt instruments are nothing less than the redefinition of world-class. The overall architecture of the amplifier chassis minimizes the presentation of external vibration. The internal parts are the finest kind, specifically chosen for sound and reliability. Starting with 0.25” aircraft aluminum for a rigid basis, and tailor the mounting points and couplings for the desired result. Custom machined feet provide a slight, controlled decoupling of the power supply from the external environment, while the audio chassis connects via a tripod of custom designed stainless steel cups and balls, controlling of the flow of vertical energy inputs and dissipating lateral energy inputs. The chassis is finished in a metallic base coat/clear coat finish. The sculptured faceplates must have been made from a solid block of aluminum — they are 3/8 inch thick with the edges chamfered to about 1/4 inch. Finished in silky gold-speckled black, the faceplates are an almost artistic likeness of the VAC’s sound quality. To guarantee quality, all chassis parts and lacquering are done in-house. The hand-wiring approach presented in the Statement 450 far exceeds conventional hand wiring and previous three dimensional techniques. Careful architecture and orientation of parts in 3D allows passive control of radiated fields to an unprecedented degree for an audio amplifier. Special consideration of the ways in which they interact with the chassis, sensitive circuit points, and each other increases purity and resolution. Between the two chassis, 105 lbs. of custom magnetic transformers contribute to the corresponding optimal mass loading. The Statement 450 features a direct-coupled input and driver circuit, extremely fast and vivid sound is achieved from both single-ended and balanced sources. This technique uses fast, lithe devices in an analogue parallel processing configuration that allows the speed and control required to preserve delicacy and natural sound. This circuit gains much greater control over the transfer function achieved in the output stage, improving linearity and increasing headroom. There is palpably more control, greater subjective power per watt, and increased detail. The external power supply also uses custom transformers, wound in the USA; there are no lightweight off-the-shelf magnetics here. The three massive transformers, which power seven separate basic supplies, are isolation mounted in a separate shielded segment of the power supply chassis and potted in place with a special material to ensure low mechanical noise and vibration. WARRANTY: Two years parts and labor, excluding tubes (USA). See manual for full details. 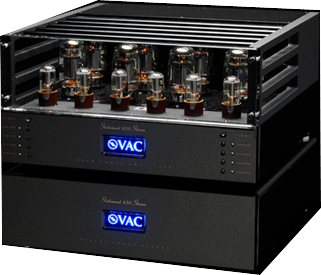 The Statement 450 iQ power amplifier is the first in a series of VAC components featuring the new VAC iQ Intelligent Continuous Automatic Bias System (patented). 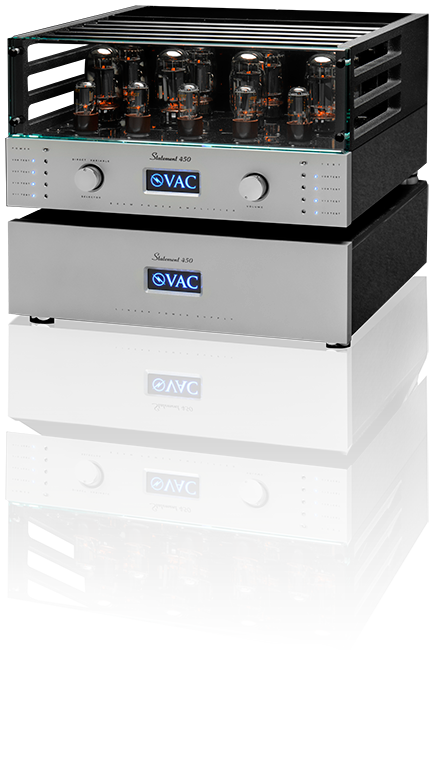 The VAC iQ System builds on the unprecedented performance of the original Statement Series and takes it to a whole new level with a set of critical enhancements. 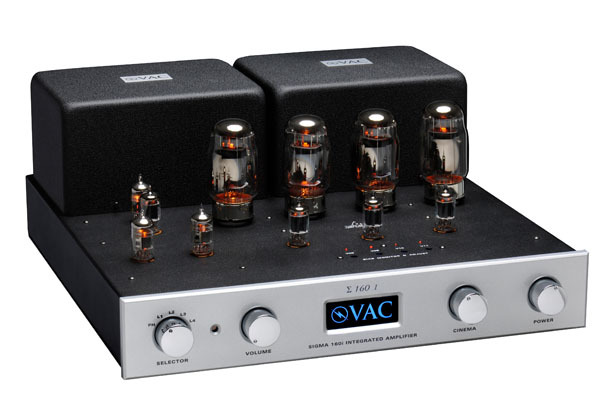 The VAC iQ System is the result of 18 years of research and development by the engineers at VAC, and represents the first time in history that each tube in the output stage of a vacuum tube amplifier can be held precisely at the optimal bias point (underlying true quiescent current) at all times, regardless of how loudly or softly the music is playing. The result is sound that is always the best it can be, reduced distortion and noise, longer tube life, elimination of gas current ‘run away’ tubes, and increased reliability, all without any effort by the user. The VAC iQ System alerts you when a tube is growing weak or has failed. In short, tube drama is a thing of the past. The Statement iQ power amp features improved output transformers (56 pounds per monoblock!) with smoother, more extended frequency response. Input signal handling has been changed to a more pure, direct connection. Various changes to the power supply and chassis materials compliment and support the iQ system and circuit refinements. The 225-watt/channel Statement 450S is a reduced-scale application of all of the techniques, concepts, and parts developed for the larger Statement 450. It is appropriate for the highest quality systems where space is a consideration or where extreme power is not needed. The 128-pound audio chassis is floated via an energy decoupling tripod atop the 84-pound power supply. Simply put, this heirloom quality instrument is second only to the Statement 450 monoblocks for reproducing music with the “breath of life” that is always VAC's goal. This 100 watt per channel stereo, 200 watt monoblock powerhousefeatures the exclusive patented *VAC iQ Continuous Automatic Bias System,the only system able to hold each power tube's true underlying idle current perfectly steady at all times. The results? More detail, increased subjective power, greater stability, lower noise, less distortion, and no more runaway tubes. The groundbreaking Phi 300 pioneered the unique direct-coupled Class A triode input and driver circuitry that allowed VAC to get closer to the sound of the recording studio or concert hall than ever before. This consummately musical performer is also extraordinarily flexibly, with settings for fully balanced or single-ended input, selectable front panel attenuators, 150-watt/channel stereo or 300-watt mono modes, and triode or ultralinear output operation. Its eight beam power output tubes yield 300 watts in dedicated mono mode or 150 watts/channel in stereo mode at the choice of the user. Front panel level controls may be engaged to aid in balancing biamplified systems. Both balanced XLR and single-ended RCA inputs are provided. The chassis is machined aluminum, with the tubes beautifully showcased behind 0.75” glass. Also included are standard 12-volt triggers. The Phi 300.1 is based on VAC's direct coupled input & driver circuit, both single-ended and balanced (fully balanced amplifier mode) inputs are provided. The chassis is custom machined 0.25” aluminum welded into a solid unitary structure, finished in metallic black paint. The 1” thick aluminum front panel is finished in hand rubbed silver metallic lacquer, with bias meter and tube adjustors that make it easy to maintain and optimize. Output matching taps are provided for 2, 4, and 8 ohm speakers. Balanced input via XLR jack, non-inverting relative to pin 2 (“pin 2 hot”, traditional EIA/RCA broadcast/recording standard). 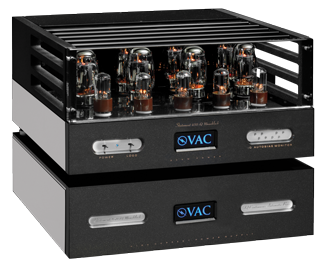 VAC’s smallest power amplifier yields fidelity sound far superior to previous award-winning instruments. Through careful voicing and quality control, the “jump” factor of the sound suggests far more than the measured 100+ watts per channel. The basic circuit of Phi 200 is a simplified take on the topology employed in the Statement products. Both fully balanced and single-ended input modes are supported; by switch setting, the front-end circuitry is rearranged to be correct and optimal for the selected mode. Another switch converts the Phi 200 from a 100+ watt/channel stereo operation into a true 200+ watt monoblock with great power and control. The ability to set the amplifier for either stereo or mono operation allows freedom of application (biamp one day, monoblocks the next), and the ability to pace the development of a system. You can start with one Phi 200 in stereo mode today and add a second one later for additional power and true monoblock performance. The Phi 200’s wideband power is developed using KT88 beam power vacuum tubes, exploited to fullest advantage by 14-pound, custom-wound, 21-section output transformers. With Class A1 direct-coupled low-mu triode input and driver stages, the result is fast, full, detailed sound. Discreet amber indicators direct adjustment of the output tubes for ideal sound. The lacquered 9.5 mm fascia beautifully compliments the rugged 2.4 mm non-magnetic chassis. The massive power transformer is fully potted to assure quiet operation. A 12-volt trigger input is accepted. An optional glass/machined aluminum cage is available, for an appearance reminiscent of a Statement amplifier. 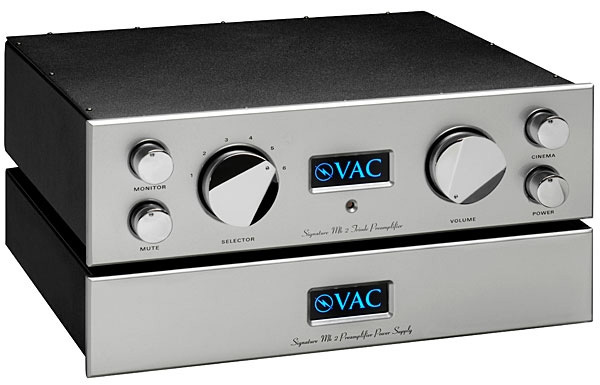 At first glance, the new VAC Phi 170 may seem like a typical 85 watt per channel stereo amplifier. Sure, it can be transformed into a 170 watt monoblock at the flick of a switch, and it has a fully balanced input mode, but the real breakthrough is inside, for the Phi 170 is equipped with the revolutionary patented VAC iQ Continuous Automatic Bias System. The VAC iQ is the only system able to hold each output tube’s true underlying idle current perfectly steady at all times, no matter how much you turn up the volume. Say goodbye to manual tweaking, bias drift, thermal tracking effects, dynamic load-line shift, runaway tubes, and blown fuses. Say hello to more detail, increased extension and punch, lower noise, less distortion, and high reliability. 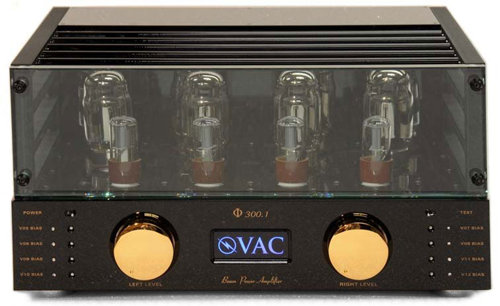 The Statement Line Amplifier is a high current, low impedance, balanced Class A1 triode vacuum tube amplifier. While inherently balanced in design, its high precision wideband transformers accomplish conversion to single-ended operation in a sonically transparent way. The chassis is machined at VAC from high-grade, non-ferrous aluminum and processed through a series of plating steps. The resulting AICuNiCr chassis possesses superior RF rejection properties across a wide range of radio frequencies for greater resolution and subjectively blacker backgrounds. Similar care is taken around each of the six wideband audio transformers in each unit. In addition to the five regular line inputs, three of which may be used with balanced sources, there is also a fixed volume input for use as a slave in a multichannel home theater system, or with other sources that control their own level. The “cinema” source may also be balanced or single ended. The audio chassis is designed with distinct isolated sections dedicated to certain signal functions to prevent unwanted interactions among the circuits. Interconnecting wires are carefully routed and directed by spaced machined nonmetallic guides. The hand-wired vacuum tube audio circuit assemblies are bonded to massive brass loading plates, which in turn are isolation mounted to the main chassis for a very effective filter at audio frequencies. The avoidance of negative feedback and inclusion of input and output transformers confers the relatively unique trait of eliminating unwanted stray interactions between the source components and power amplifier, such as long chain interactions between their feedback loops which tend to coarsen the sound and flatten the sound stage. A massive separate power supply is a dual mono design with substantial energy storage and high inherent regulation. Both resistive and inductive elements are used in concert with high-speed capacitor assemblies for the high voltage supplies, while active voltage stabilization is included in the four heater supplies and the 12-volt trigger supply. The volume control is a massive one-pound multisection potentiometer some two inches long and nearly two inches in diameter, with machined brass shielding between the sections and against the outside world. This extraordinary part is critical in obtaining the highest fidelity in the world. A custom engineered VAC motor drive system allows the volume to be adjusted by remote control. Audio chassis (not including knobs and connectors): 7 x 17.7 x 16.15 in. Power supply (not including connectors): 5.8 x 17.7 x 16.15 in. line stage chassis 56 lbs. 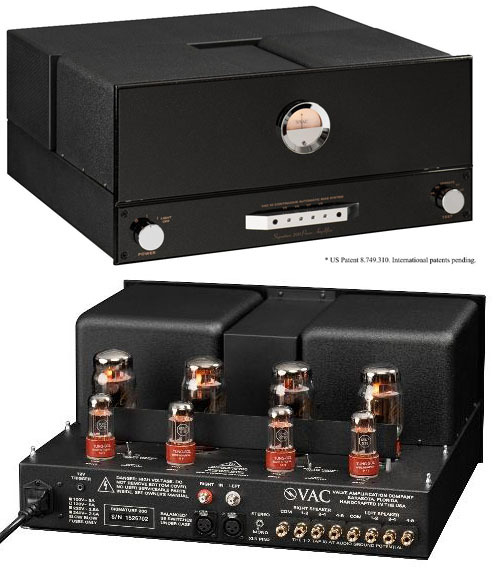 This VAC Statement dual mono triode vacuum tube phono (MM/MC, three gain modes, adjustable load, stereo/mono operation) preamplifier is designed for extreme applications. On the back panel there are two DC umbilical cords and large Amphenol aerospace connectors, a reminder of the massive dual mono power supply. There are inputs for four independent phone sources. In addition, each input may be of the conventional single-ended type or may be fully balanced. The eight twin triode vacuum tubes employed in the various Class A1 audio stages are made with the finest-grade parts, such as ‘naked’ metal foil resistors. The RIAA equalization is achieved without negative feedback, preserving the organic nature of the sound. The massive, separate power supply is a dual mono design with substantial energy storage and high inherent regulation. Both resistive and inductive elements are used in concert with high-speed capacitor assemblies for the high voltage supplies, while active voltage stabilization is included in the four heater supplies and the 12-volt trigger supply. ILLUMINATION: Illuminated logo may be switched to bright, dim, of off. phono stage chassis 56 lbs. 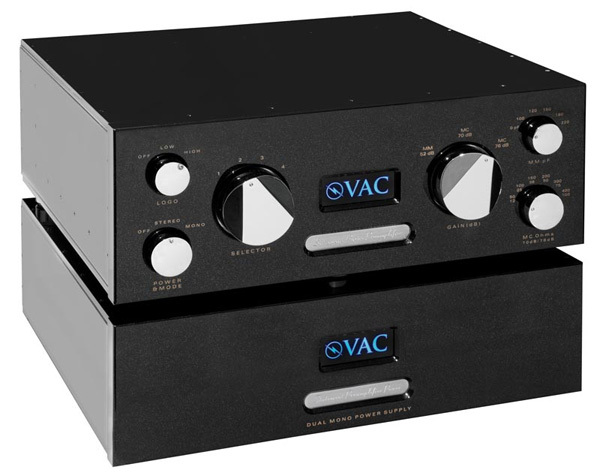 The design of the all-new VAC Master Preamplifier takes the essential developments from the cost-no-object Statement pre-amplifiers and presents them in their most elemental, effective forms. If the Statement products might be likened to Formula 1 racecars, the Master Preamplifier is the derivative ultra performance road-going sports car. All of the hand-wired Class A1 audio circuits are carried on machined, mass-loading plates, which are decoupled from the main chassis. This projects solidity in detail and imaging while reducing microphony to infinitesimal levels. You’ll find the “naked” z-foil resistors and premium transformers from the Statement Line Stage. When the Master Preamplifier is equipped with the internal phono option, a separate, dedicated power transformer and DC umbilical cable is added to the power supply, ensuring complete isolation between it and the line section. In essence, it is an external phono stage that just happens to share the chassis, which, in turn, allows a superior control over the ground signal reference that is crucial to conveying signal detail. 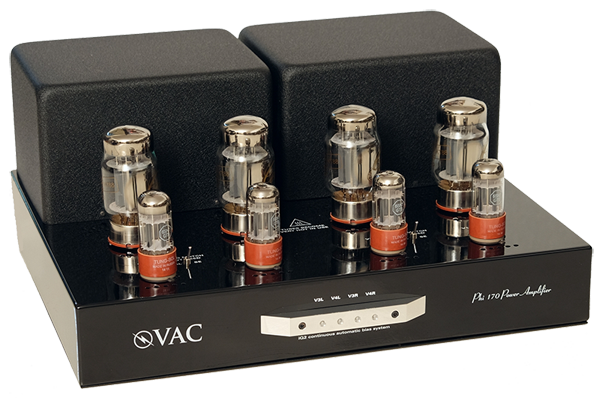 You’ll also find the same premium resistors and exotic capacitors employed in the Statement Phono Stage. VOLUME CONTROL: A custom engineered VAC motor drive system allows the volume to be adjusted by remote control. Not long ago, the Signature Mk IIa was the finest preamplifier you could buy. In production since 2000, this enduring classic marked the introduction of the basic, fully balanced, zero-feedback, transformer-coupled Class A1 triode topology found in all contemporary VAC preamplifiers. Even from this early form, it preserves and reproduces the emotion and vitality of music and maximizes the performances of the associated source components and power amplifiers. The Signature’s line stage has no coupling capacitors to detract from the purity and detail of the hand-wired circuit. With no loop feedback, the output is stable and free from dynamic interactions with the load. Six standard line inputs (five when phono is fitted) are present, as well as a fully balanced Cinema Bypass input. The optional six-tube phono stage is sensitive and quiet, compatible with low-output, moving coil cartridges. Gain is adjustable, as is resistive loading. Electrostatic decoupling prevents the heater circuits from “talking” to each other, a common cause of lost detail. A separate power transformer is used, eliminating any disturbance of the delicate phono signal by the powerful line stage. The VAC logos are backlit in an elegant blue in normal operation, and display red when the mute is activated. These are set in the heirloom-quality sculpted 3/8” faceplate. The Signature SE (Special Edition) upgrades the input transformers to the premium designs used in the Statement and Master ranges. Second only to the flagship Signature Preamplifier, the Renaissance Mk III has all of the performance and features needed in a top-class music system, including balanced inputs and output, home theater input, hand-wired Class A triode circuitry, remote control, external power supply, and optional MM/MC phono stage with variable loading. The dynamics, detail, and speed of this preamplifier bring music back to life most convincingly. 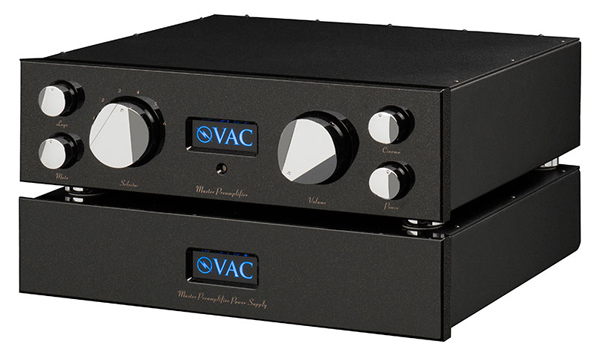 The VAC Renaissance Mk III Preamplifier is a development of the preamplifier section from the highly regarded VAC Phi Beta Integrated amplifier and provides balanced and single-ended input and output capability. It is completely hand wired, and all switching is accomplished via high purity silver contact mechanical switches. 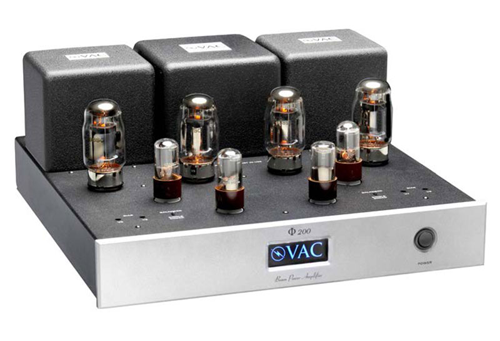 The six active circuit elements are twin triode vacuum tubes, biased for Class A1 operation. The line stage also offers a fully buffered tape loop and, which allows your high-end stereo system to integrate seamlessly with home theater. The cinema bypass input is a fixed gain input that allows your source component to control volume, and passes this signal through to the stereo power amplifiers without further processing. The lacquered aluminum volume/mute remote control is standard. In the mute state, the VAC logo changes from blue to red. The VAC remote system is implemented with electromechanical switches and controls. 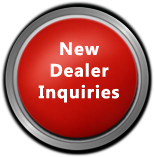 This approach is considerably more costly than the usual digital interfaces, but has several major advantages. First, no VCAs, relays, or transistor switches (switched ladder networks) are used in controlling volume. This is mandatory for sonic purity. Second, VAC’s careful implementation avoids the use of microprocessors, which generate significant noise signals that, while sometimes not audible directly, can do damage to the sound. The heavy power supply is external, with a 6 foot detachable umbilical cable. The optional MM/MC phono stage uses six triode elements with passive RIAA equalization. Variable gain (42/62 dB) and variable resistive loading are provided. The standard fascia finish is black lacquer with gold metallic flake over a VAC-machined 10 mm aluminum plate. The faceted and domed countersunk aluminum knobs are also machined at VAC and finished in 10 micron gold. Silver with chrome is optional at added cost. 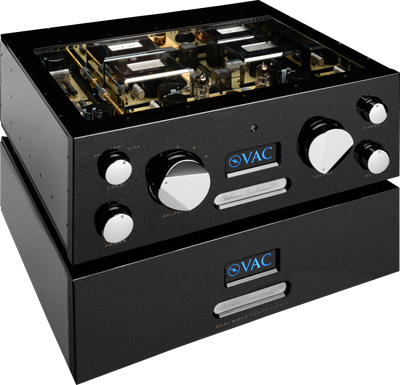 VAC’s most affordable and compact music solution is a full-integrated amplifier, with 85-watt/channel power amplifier, true triode tube line control amplifier, and triode moving magnet phono stage. Flexibility is ensured by standard remote control, home theater input, preamplifier outputs, and optional MC and balanced inputs. If sound quality and simplicity are the priorities, this exceptionally musical amplifier is the answer. Quality is held to VAC’s high standards, with great care taken in combining all of the elements of separate components into a single, well integrated package. Of particular essence is the presence of a true line stage (with optional balanced inputs), and a proper volume control (not a digital or VCA control on a microchip as is the modern fashion). The fact that every single stage in the audio chain is in intimate proximity means that they can share a very tight, precise common ground reference, to realize the true performance possibility of the integrated form. To ensure purity and stability, the Sigma 160i incorporates separate rectifiers and power filters for the preamplifier sections. Similarly, the mechanical placement of all of the parts, from the transformers to the vacuum tubes to the capacitors and resistors has been undertaken using the principals embodied in VAC's cost-no-object Statement amplifiers. The Sigma 160i SE (Special Edition) enhances performance by upgrading the input transformers and many passive parts to the types used in the premium Statement instruments. Greater size, detail, speed, and weight is the result. An optional glass/machined aluminum cage is available, for an appearance reminiscent of the Statement amplifiers. NOTE: Phono stage does not invert absolute phase.